Pailung sought to gain understanding of fabrics and fabric construction to enhance its technology offerings for manufacturers. You may not have heard of the Pailung Machinery Mill Co., but if you are involved with weft knitting in any way, you really should get to know them. Pailung — based in New Taipei City, Taiwan — is one of the world’s largest manufacturers of circular and flat weft knitting machines. Literally, thousands of its machines are in use throughout the world, producing weft knit fabrics for a multitude of industries and applications. However, if you speak with Pailung’s Chairman and Principal Owner James C. C. Wang, he will tell you simply that, “it’s really all about the fabrics.” This philosophy, which evolved out of a specific conversation years ago, has become one of the guiding principles propelling Pailung to become not only a leading weft knitting machine manufacturer, but also a valued solutions provider to the textile industry. It was a comment from a customer years ago that prompted Wang to reexamine Pailung’s business philosophy and future direction. During that iconic discussion, “The gentleman looked at me and said ‘you’re just a machine builder, what do you know about fabrics?,’” recounted Wang. “At that moment, I realized that if Pailung was ever going to be the premier weft knit machine supplier to the world, we needed to have a complete understanding of fabrics and the techniques and technologies involved in making them. How can we expect to build better machines if we don’t completely understand the fabrics that we can make on them?” That specific customer exchange led directly to a fundamental change in business philosophy, which included the creation of Pailung’s Open Innovation Lab, the expansion and diversification of its machine offerings and a new emphasis on all aspects of the weft knit supply chain. The results of these efforts have positioned Pailung as a global leader in weft knitting technology. 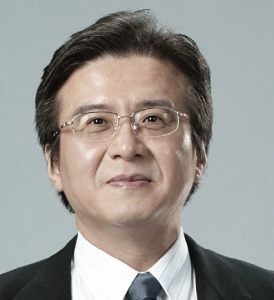 James C. C. Wang, chairman ,and principal owner Pailung Machinery Mill Co. The Open Innovation Lab is available to collaborate and cooperate with all tier levels of Pailung’s customer base. It has grown to become a resource for brands hoping to create a new edge, designers and manufacturers searching for inspiration or a different look and feel, innovators hoping to prove a new concept and others simply looking for that intangible spark. As a result, the Open Innovation Lab has evolved into a repository containing a wealth of information. All around — on shelves, tabletops and racks — are untold numbers of knit samples created over the years on Pailung equipment. In addition, there are between 6,000 and 7,000 rolls of different fabrics in storage that customers can choose samples of, compare to others or simply gain motivation from. And for customers who aren’t able to visit the Open Innovation Lab frequently enough, Pailung now sends out swatch books with new and varied fabric designs quarterly to provide inspiration. A variety of dedicated sample machines staffed with talented technicians can turn around customer samples within two to six weeks depending on the level of complexity. As fashion product cycles continue to change faster and with customers looking for more turnovers, seasonal or otherwise, the resources provided by the Open Innovation Lab quickly become invaluable to those who are able to use them. However, the Open Innovation Lab is not only dedicated to the fashion industry. New applications and endeavors outside of the traditional textile industry are being created on a more frequent basis as the industry continues to evolve into new frontiers. Currently 70 percent of Pailung’s weft machine customers are in the apparel and fashion industry segment. Wang believes this percentage will drop over the next five years to 40 percent with the remaining 60 percent comprised of industrial, technical, smart textiles and unknown new sectors. “We want to help define, redefine and create new product categories for the textile industry. The Messe Frankfurt-owned trade fair Techtextil currently identifies 12 sectors. We want to help define and create what comes next — it’s a natural progression,” Wang professed. The resources available through the Open Innovation Lab certainly present nothing to contradict this notion, nor does Pailung’s research and development philosophy. Pailung approaches each market segment and, in fact, every country they sell products to individually, complete with separate strategies. Wang’s perception is that: “Every segment is different and views their products as such. So, you have to respect that and modify your sales efforts to also respect each perspective. Like other successful companies, Pailung’s employees are the driving force to its culture. “Teamwork is the key,” Wang said. “Getting all the different mindsets, creative fashion designers, engineers, programmers and workers on the shop floor, to work together as one is critical to our success. Effective communication between departments is a must.” Continuous efforts to train every Pailung employee is an ongoing process that never stops. “We have to control our own future, so we will always spend on training our employees, especially those new to the company, so we always have a new breed in the offing ready to go” Wang said. Every employee at Pailung is encouraged to learn through the training programs provided by the Open Innovation Lab, many of which are also offered as a service to Pailung’s customers. Pailung is a leader in weft knit technology and continues to spend aggressively on research and development. Its machine offerings are virtually unlimited, which include up to 85 different circular weft machine configurations from very basic to extremely complex. 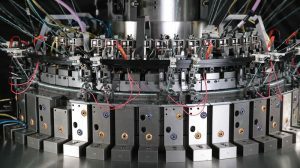 Pailung manufactures approximately 60-percent of each machine’s components in house, including critical items such as cams, carriers and cylinder boxes. The rest are purchased from approved suppliers, many of whom have established long-term relationships. Pailung added flat knitting machines to its lineup a few years ago because it felt weft knit technologies could be transferred between flat and circular configurations to produce even more interesting fabrics. One of Pailung’s new flat knit machines is capable of knitting spacer fabrics where the in-line spacing can vary in thickness from 3 millimeters (mm) to more than 15 mm should the application call for it. Weevknit technology blurs the lines between knit and woven fabrics. As fabric preferences change, the machines used to make those fabrics also need to change. Pailung has seen significant growth in the sports, exercise and outerwear markets — including the recent efforts to create knit shoe uppers — and has created machine characteristics to address the specific needs of these areas. Home textiles markets — including mattress ticking, blankets and the upholstery markets — also show great interest for the new WeevKnit line of circular and flat knitting machines recently developed by Pailung. WeevKnit fabrics exhibit the look and feel of wovens, but maintain many of the characteristics recognizable in knits, which Pailung believes will help interior designers by allowing for better contours and curves. In automotive applications, Honda now uses WeevKnit fabrics in some sport utility vehicles, and Hyundai incorporated WeevKnit fabrics into the Sonata’s upholstery. MultiFleece™ is another example of machines changing to meet the designer’s needs. Pailung’s MultiFleece machine technology incorporates jacquard needle selection capabilities on both sides of the fabric. This allows a designer the freedom to create completely different patterns on the front and fleeced sides and fully integrated into the fabric construction. Pailung also has developed new and improved techniques to allow for inverse plating with smooth intarsia color transitions, virtually seamless reverse plaiting techniques and exponentially increased patterning effects and color change capabilities. Textiles are about look, touch and feel and Pailung’s advances in weft knit technology and techniques appear to broaden and in many cases blur these boundaries. There was a big trend and push a few years ago for seamless garment technology, but according to Wang, after looking at the data, there was not a real cost or performance advantage for seamless garments in most applications when compared to traditional circular knits with cut-and-sew processing. So, efforts to create knitting machines in this area were reassigned to other applications viewed as more probable opportunities. “You have to adapt to the industry needs, wherever they may lead,” Wang professed. However, as the number of diverse machines and differences in each grow, they still need to be serviced and maintained. 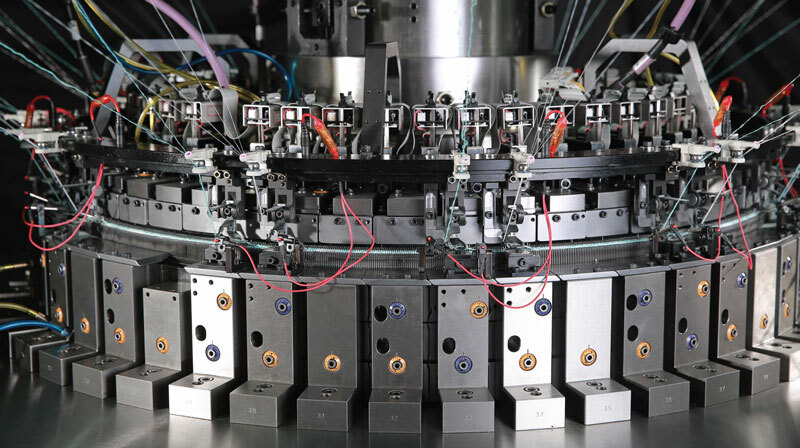 Pailung’s machine designers have learned to standardize, modulize and simplify the machine designs wherever possible to keep service and parts supply needs to a minimum. Pailung’s Spinknit technology — a new circular weft machine concept to be introduced this year, which allows sliver to be directly fed into the knitting machine where it is first drafted into yarn then knit into fabric via one continuous process — is one example of the need for this adaptive approach. “Customers for this technology may be fiber and yarn spinners,” Wang said. “We’ve never sold to spinners before. What is their mindset? How are they different from our traditional customers? How do we adapt to meet their needs?” Wang inquired. Adapting to meet the needs of a constantly changing marketplace is at the root of Pailung’s success. Remaining interested in any and all opportunities certainly has played a large role as well. “I’m optimistic that knits can be used almost anywhere,” Wang said. “We’re still young, interested and growing and want to have a larger role in the industry as a textile player to contribute our results to other industries wherever useful.” After all, it is all about the fabrics.